We’ve just launched some cool stuff at work. 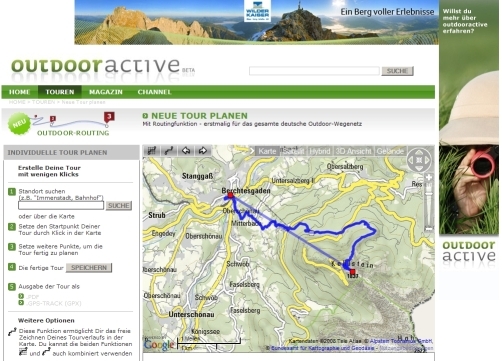 So anyone interested in individual hiking routes should check out the Outdoor-Routing-Planner – unfortunately, outdoor routing only works for Germany so far and you have to deal with a German UI, but if that is not stopping you, I highly recommend you check it out and have a go- good fun! Hit the save button (Speichern) to save your route. Dieser Beitrag wurde unter Outdoors abgelegt am 7.11.2008 von admin.